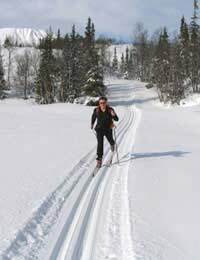 Luckily, most of us don’t learn to cross-country ski the day of a race, so we can take the time to learn balance and rhythm without pressure. Like any winter sport, professional lessons are the best way to learn proper technique, and most cross-country courses offer rentals and instruction. Classical technique, utilizing the parallel tracks set by a grooming machine—decreasing the ski’s tendency to fly around—is generally the easiest technique to learn. Many instructors liken the first steps in XC skiing to sliding on a slippery kitchen floor in socks. Start with small short shuffling slides, alternately pushing one foot forward then the other. Notice where your balance is, hopefully it stems up from your lead foot through a strong stacked leg (meaning all the bones aligned so your leg is underneath you). Your upper body should be relaxed and sitting comfortably over your hips, not bent over looking at your toes. As you scoot forward, try not to swing your arms around wildly. Within the first five minutes of shuffling, most beginners experience a real glide. Exciting and unsettling, the first instinct is to sit back. Try to trust your body and ride the glide, staying stacked on your leg. Chase the new glide with your body leading from your hips. Don’t mind the wobble, your body will adjust. Continue sliding and gliding, but begin to swing your arms naturally. Just as you’d walk or run with opposite-leg opposite-arm motion, so you ski. Keep the pole angled down to the ground, but bring your arm up until the point of the pole is just outside the tip of your ski. Kick your opposite foot forward and push back, swinging your arms by your hips and extending it all the way through behind you while you bring your other arm forward; as in a golf swing, the follow through counts. Try not to cross your body with the poles; it wastes energy and can be dangerous, especially for passers-by. Now stop thinking, and enjoy the rhythm. With distance and confidence, you may be ready for a bit more speed, especially on the flats, were the Diagonal stride is too slow. Double poling provides more leverage for momentum. Reach both arms ahead, simultaneously planting both poles angled back at the tails of your skis, and pulling both arms back. Keep you legs relaxed, with a slight flex in the knee and ankle for dynamic balance. Contracting your abdominal muscles and subtly pushing you hips forward will add power to the move. Beware of “the sitting” position when polling. When you feel comfortable with diagonal stride and double poling, try double pole with a kick. Just like in the diagonal stride, drive one leg forward, while pulling back with both poles, match both legs swinging your arms back, and then repeat the motion kicking the other leg forward with the poles. The diagonal stride will take you up hills as well as across flats. The wax or scales on the bottom of the ski underfoot help maintain traction and your forward driving kick keeps you moving forward and up. Maintain a good rhythm, and shorten your stride slightly with the grade. Be sure to remain upright in relation to the hill, keeping your chest and head raised. When a hill becomes too steep to glide up, walking up is necessary. Herringbone, or duck walking, uses the sides of the skis to grip the snow. Step out of the tracks and spread your skis into a V shape with the tails together, but not crossing. Step one ski forward, keeping the tip pointing out and making sure the tails are not crossing. Dig the edge in and take a step with the other ski, again keeping it at the same angle. Use your poles for balance and remember to stand up feeling your skis rather than bending to look at them. Now with diagonal stride, double poling, and herringbone in your bag of tricks you are ready to spend a day or at least a few hours out on the trail. With just a few days of practice, you may be ready to leave the groomed tracks and explore your world.